Are you looking for a fun Do-It-Yourself activity that is kid friendly, and may even reduce your stress level? 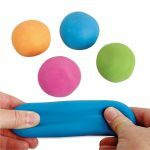 Look no further than a homemade stress ball! This can be made easily and mess-free with common household items, and you don’t even need a balloon. Essential Ingredients You Will Need! Step 1: Measure out the ingredients using the measuring cups. Put the aloe vera gel into a mixing bowl. Step 2: Pour half of the cornstarch into the mixing bowl and begin to mix it with the spatula. Step 3: Once the first 1/2 cup of cornstarch is mixed in, add the remaining cornstarch and mix as well. Step 4: Once the cornstarch and aloe vera mixture form a solid ball, you can remove it from the bowl and continue to knead it with your hands. Step 5: After several minutes the mixture should be firm and of even consistency. Viola! That’s all there is to it! Aloe vera gel can be found in most stores near the lotions and body care items. However, you also have the option of substituting the gel with any hand or body lotion. You can choose a lotion that has a nice soothing smell to aid in relaxation and further reduce your stress. As an added bonus, if you use a rich lotion with coconut butter or almond butter, your hands will feel smooth a moisturized when you are done massaging the stress ball. Because most lotions and aloe vera gels are water-based, your stress ball can dry out. To avoid this from happening, you should store the stress ball in a plastic bag when you are not using it. You can easily make a larger stress ball, or multiple at one time, by simply doubling or tripling the recipe. Once a large ball is formed in can be divided into as many smaller balls as you see fit. Corn starch is by far the best ingredient to use for this recipe. It’s clumping properties enable the stress ball to form without crumbling or becoming too slimy. However, if you are in a bind, you can use baking soda instead of the corn starch. You may have to use slightly more that 1/2 a cup of baking soda. Just slowly add additional amounts until the ball is firm and sticks together. Try making your stress ball a different color by adding food dye. This is especially popular among children! Just be sure not to add too much food dye, or it could turn your hand’s colors. Add a drop or two of essential oils to the mix. Add a teaspoon or two of glitter. Again, this is definitely a pleaser for kids! Where Did The Fidget Spinner Originate?